Now I'm usually all about the "shallow" stuff. Makeup, skincare; generally things that go on the surface of your skin and enhance your appearance from the outside. But there comes a point in your life when you start getting problems that regular skincare cannot penetrate deep enough to fix, but you're not quite at the point where you need to start considering anything drastic yet. Many of you know I'm a big believer in prevention over cure. Rather than spending a lot of money trying to hide the signs of aging with temporary fixes, if there is something that can potentially rewind the clock and get your body to naturally behave like it used to a few years ago, then that's really ideal to me. Which is why I even considered Thermage in the first place. For those of you who are not familiar with it, Thermage - in a nutshell - is a non-invasive procedure where pulses of radio-frequency waves are sent into the deeper layers of your skin using a special device. This energy stimulates your skin and triggers a response whereby it ramps up collagen production and regeneration for 3-6 months following the procedure. Basically, it's like a wake up call which forces your sluggish cells to behave the way they used to years ago. I used to have the misconception that Thermage was like a non-invasive "lunch time face lift". I.e. it was meant for "mature women". (I'm not young; I'm 33. But I do take good enough care of my skin that I feel I'm relatively young-looking for my age.) So Thermage couldn't be right for me, no? Enlarged pores: Collagen is what holds our pores close. As we get older and collagen levels diminish, the skin around pores gets slack and leads to the appearance of larger pores, even without black heads. Expression lines: Fine lines form around our eyes, forehead, and beside our noses and mouths from daily movement, and start to become more pronounced or stay there permanently even when we're not frowning or smiling. 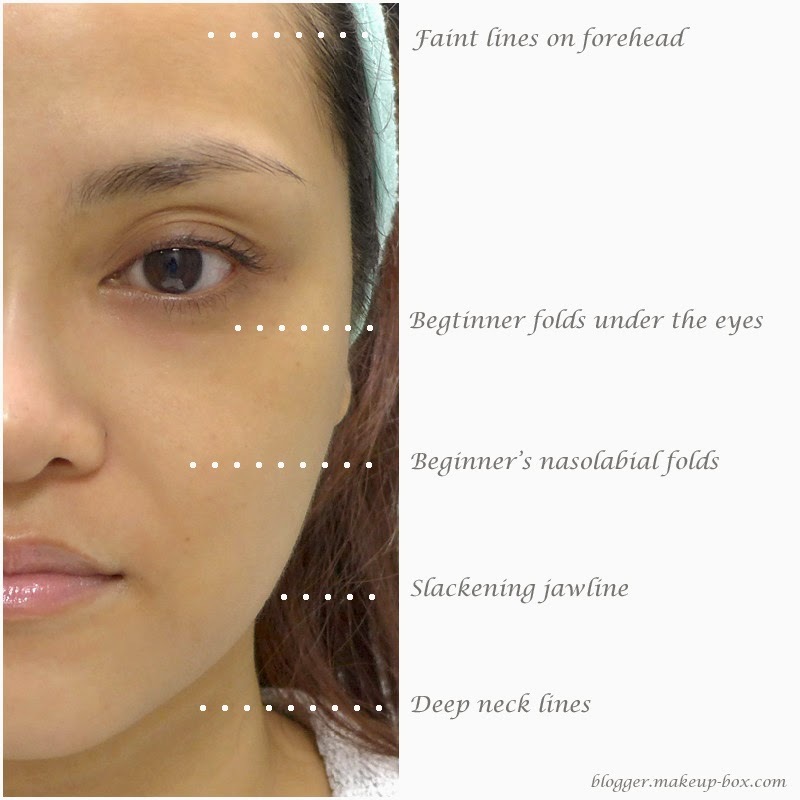 Slackness/Sagging: One area women often don't pay attention to until it's a bit too late is the jaw line. Around your 30's is the time our lower cheeks start to slide downwards imperceptibly. Our faces start to look square and our jaw line less smooth. In time, they can develop into marionette lines (deep furrows leading from the outer corners of your mouth down towards the jaw), full blown "bull-dog" jowls, and a double-chin. Now here's a reminder. Thermage works best on women in their 30s - 50s, whose skin is still in relatively healthy condition. For skin that has aged to an advanced degree, Thermage is not as effective because there isn't enough of a healthy collagen matrix left to stimulate. Also, if you are in your 30's, the results from a single session often lasts much longer (about 2 years) than if you were doing it in your 50s (about a year). Thermage's latest advancement Total Tip 3.0 (left) versus the previous face tip. If you're in your 20's, Thermage can still stimulate your collagen and give it a boost, but you won't see much of a noticeable difference because your skin is probably still in its peak condition. Thermage pre-treatment image (photo credits - Aesthetics & Hair Clinic): my personal areas of concern! 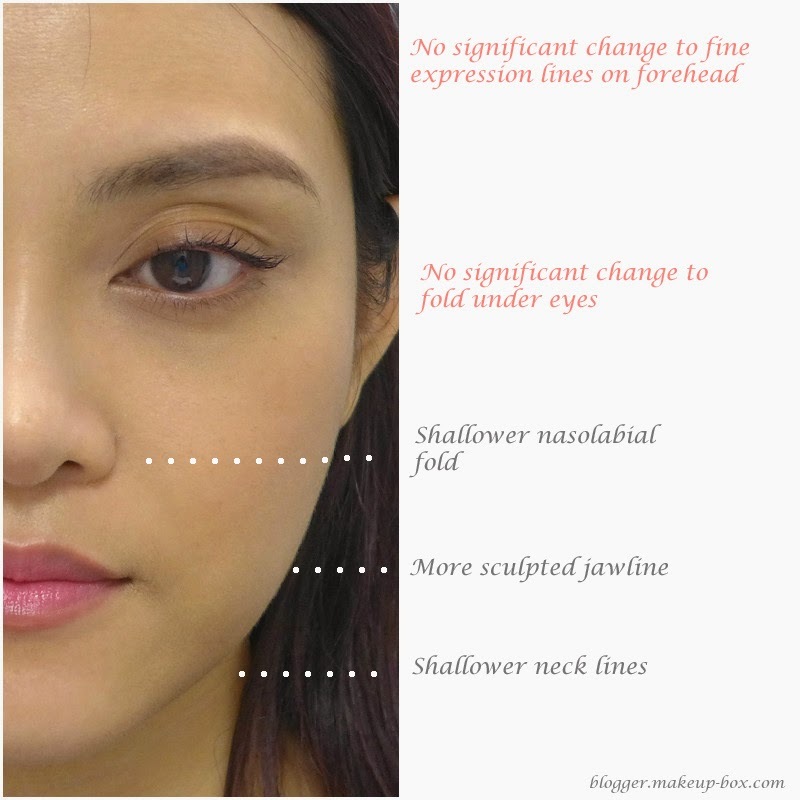 During my pre-procedure consultation at Aesthetics & Hair Clinic with Dr Tyng Tan, we discussed my "pain points", and I mentioned expression lines (mainly the nasolabial lines), lines on my neck, as well as a slackening jaw line. We agreed this would be the area we want to focus more on during my treatment. I was led to the treatment room where my skin was cleaned, numbing cream was applied, and then a marker sheet applied (see the scary image above). Thermage has adjustable energy settings and your doctor can dial it up or down depending on your pain tolerance. Unfortunately, I was a complete wimp and even with the numbing cream, I could only tolerate up to about level 2. After the procedure which took about 30 mins, my face was cleaned, I was given a post-treatment balm to use for a few days, and I simply walked out without any redness or residual pain. Immediately that night, it felt like my skin was tighter. But I decided to put that down to some subtle post-procedure swelling, and didn't want to jump to conclusions. A month later, my neck lines started looking a bit less deep and obvious, and my jawline felt tighter, more sculpted. Pores are also seem more uniform and tightened. 2 months in, my nasolabial lines are much shallower, as are my neck lines. What I did NOT expect was that my jawline actually looked more defined and tapered (more a "V" then a "U" if you know what I mean) compared to before images. I hadn't lost any weight. In fact I probably gained a little, so I was expecting my jawline to look puffier compared to before. I didn't notice much of an improvement to the eye or forehead areas. I got the pre- and post-treatment images directly from the clinic after my review visit. They were taken by a nurse, not myself. I also did not retouch or edit other than to add in text and water-marks. My next review is in another 6 months, because Thermage continues to work for up to half a year, so in the good cases, patients see a continual improvement for quite a while. It's expensive. It's not like buying a $50 face cream or a $100 serum. You do need to consider it carefully. But if you're tired of buying and trying so many different anti-aging products and having a majority of them do nothing for you, maybe it's time to try something different. I won't lie. There is a certain amount of pain to tolerate. 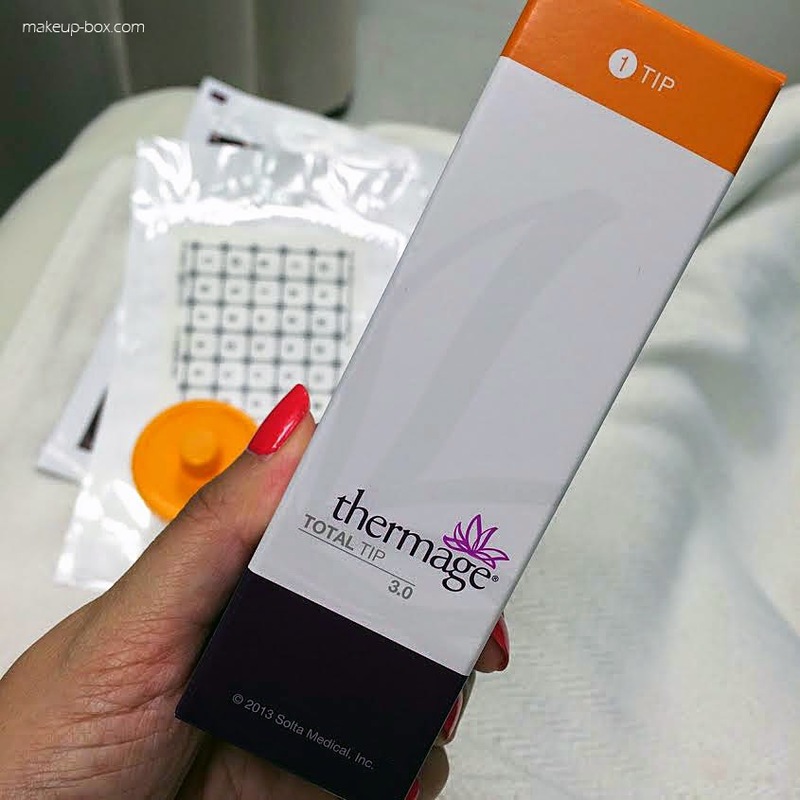 Thermage is an "as much as you can handle" treatment, so no matter what, you'll need to raise the setting to the point where you feel you can't go any higher. In some cases, patients who have a very high pain threshold might experience mild blistering, redness or some peeling. This is usually minor and goes away in a few days, but if you have a major event to attend (like your wedding) and need to have zero down-time, you will need to be careful and stick with a slightly lower setting. It isn't as effective on everyone. Everyone's skin condition is different. As with all things, some people may respond to treatment better than others. P.S. If you have a low pain threshold like me, don't feel you're not getting your money's worth, because using a lower setting and doing more passes over an area (as opposed to going over an area only once at a high setting) can give similarly good results while reducing the pain you need to bear. All in all, I have to say I'm very pleased with the results. I'd actually thought there wouldn't be any difference, and the only benefit for me would be that of stimulating my skin's collagen production levels. But apparently, there WAS a visible difference. And I do have to say, it's kinda cool that unlike Botox or fillers, it's my skin condition that's improved, and the benefits do last for up to 2 years. It's like suspending the aging process for awhile. I'll still be in a far better state than I would be if I didn't have the procedure now. the truth in healing has an extraordinary proprietary formula featuring the richest source of 100% bio-available Humic Fulvic Acid along with micro and marco mineral nutrients. This highly refined product consists of tiny, extremely complex molecules. The unique nanotechnology used in this formula sets it apart from any other product claiming to be similar in nature. android version The android variation that has actually been Leo Playcard type of root process. It is readily available totally free for the customers. The trimmer's steel reducing sides Top 10 Beard Trimmers Reviews while being compared to a common trimmer. Best Beard Trimmers for Men Include a high-precision reducing blade with Japanese innovation. doodlekit whenever you plug in the battery charger. http://doodlekit.com such as the nose trimmer, ear hair trimmer. official source Provides you with the easy-to-select lock-in size setting ranging 0.4-10mm.